My review for Son of Rambow, the best Sylvester Stallone-affiliated thing to exist since Death Race 2000 — and that’s including Brigitte Nielsen. Think back to childhood, when a movie could set your mind on fire and launch you into countless afternoons of adventure. Star Wars, Indiana Jones, whatever grabbed your young mind — you’d spin the original movie into any number of new stories. Son of Rambow captures this children’s take on cinephilia and builds around it a portrait of life for two boys in early 1980s England. The typical movie events that often bring together the picked-on with bullies, in this instance pairs meek Will Proudfoot (Bill Milner) with boisterous Lee Carter (Will Poulter). 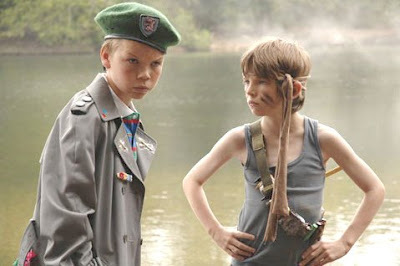 But that doesn’t mean Son of Rambow falls victim to the sappiness of so many coming-of-age movies. No, the script by Garth Jennings rings true, likely because Jennings constructed it upon a phenomenon he knows well: pure love for a movie. Enamored with Sylvester Stallone’s First Blood to the point of obsession, the boys set out to create their own sequel, in which Stallone’s character must be freed from an evil captor (a scarecrow who employs a flying dog) by his son. Lee aims to enter the short in a BBC young filmmaker contest, but Will uses it to grapple with his father’s recent death and his family’s membership in a strict religious sect that forbids pop culture and denies Will an outlet for his prodigious creativity. Though most audiences will leave the theater chuckling at the boys’ attempts at creating action scenes, the true highlight lies in the slips into Will’s imagination. His fantastic doodles literally explode into life in animated sequences. Jennings and producer Nick Goldsmith exhibit the level of visual flair one should expect from music video producers responsible for the phenomenal walking milk carton from Blur’s “Coffee & TV” video. The failure of their previous feature, 2005’s A Hitchhiker’s Guide to the Galaxy, now behind them, the duo has seemed to gain their footing. Anyone who loves movies should eagerly anticipate their next work. And Son of Rambow — with its deft mix of comedy, heart, and art — seems a likely candidate to become a cult favorite — for those also awed by First Blood and for anyone who can appreciate the unfettered creativity of childhood. And because it never fails to put a smile on my face, here's "Coffee and TV." I have found a awesome Site. Unreleased movies LEAKED from studios.